I remember the summer before I started college. I was watching tons of YouTube videos on college essentials, freshmen tips and advice, college reflections, and many other college related videos. Watching these videos made me more pumped for college and they also made me feel more prepared. So I thought I’d return the favor and help others prepare for college. In this blog post, I share one item (or it considered two?) that you must not forget to bring with you to college. Shower shoes. Shower shoes are essentially just that, shower shoes. These are shoes that you will wear when you use the shower in your dorm. 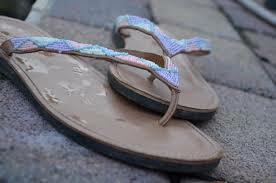 They can be flip flops or sandals, just any type of shoe that is water friendly. There’s no need to get expensive shoes. You’ll only wear them when you shower and it really isn’t necessary to be busting money on a pair of shower shoes. These are essential because you want to protect yourself from any bacteria and/or infections that might be lingering around in the showers. Grab your shower caddy with your toiletries and remember to bring your shower shoes! Trust me, you probably don’t want to be barefoot in the shared dorm bathrooms.